Arena 8 Decent 3 musketeers deck | Clash Royale fan-site! 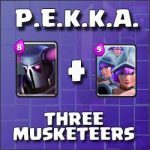 Three Musketeers is one of the rare cards in Clash Royale with the help of which we can place on the arena three separate musketeers simultaneously. 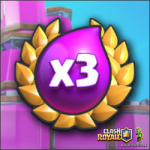 As of July 2017, Three Musketeers is the most expensive card in the Game (it costs 9 drops of elixir). The huge advantage of this card is the relatively big total damage power of all three units together. With a good pair and correct tactic, three musketeers can destroy opponent’s tower in seconds! However, this card has at least one huge minus – relatively low hitpoints. According to this, all three units can be eliminated together by Rocket, Fireball or Lightning. Here and so. 1. Three Musketeers. The main card in the deck. 2. Ice Golem. This card unlocks at Arena 8. Despite low damage power Ice Golem has very decent hitpoints level and very low price (2 drops of elixir only). The main role of this card is to attract enemies attention and gives more time for musketeers. 3. Archers and Spear Goblins. For defense purpose mainly. 4. Poison. Useful spell card both in attack and defense. Very effective against Skeleton Army card, with the help which try to stop Ice Golem often. All you need is to cover the route of Golem with this card. 5. Skeleton Army. For defense purpose mainly. 6. Baby Dragon. Great support for Ice Golem and Three Musketeer in attack due to high effectivity against Minions, Skeletons, Goblins etc. Ice Golem and Three Musketeers is very effective combination on Arena 8. According to the fact that these two cards are main in the deck, all strategy should be based on their characteristics. 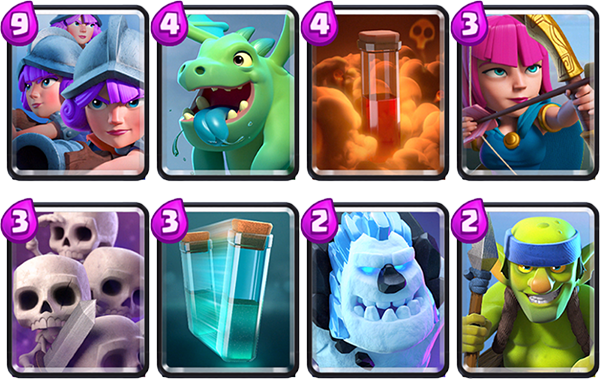 These two cards suit each other: Ice Golem – low damage power but big hitpoints; Three Musketeers – huge damage power but not big hitpoints. Thus, Ice Golem has to go ahead and musketeers behind him. The only minus of this combination is its vulnerability against such spell cards as Rocket, Fire Ball, Lightning, etc. 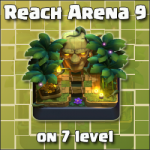 See you at Clash Royale arenas! Tagged Arena 8, Decks, Ice Golem, Three Musketeers. 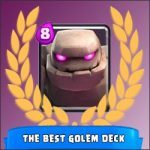 « Golem and Inferno Dragon – an unstoppable deck!